Editor's Note: This guest post was contributed by Brent Trotter, CEO of People and Words. That’s a heavy question. But it’s one that businesses ask indirectly on a regular basis. When you ask someone to sign up for your mailing list, click on your latest blog post, or sign up for a free trial, you’re asking for someone’s trust. You’re asking for their attention, their time or a sacred spot in their cluttered inboxes. In this climate, it can feel especially difficult to build trust with your audience online. This makes it harder to generate qualified leads for your business. However, there’s a framework for building trust that might improve your ROI on content. By applying “The Trust Equation” in your approach to content, you can establish trust with your audience and generate more leads. 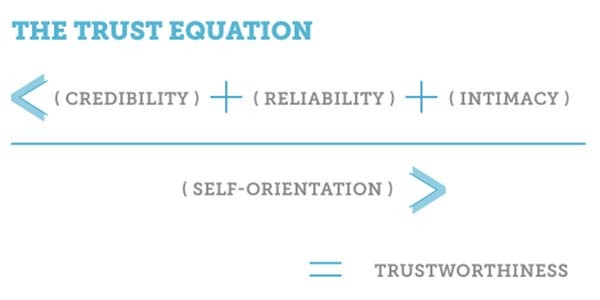 What is The Trust Equation? In the year 2000, former Harvard Business School Professor David Maister, Charles H. Green and Robert M. Galford co-authored the book The Trusted Advisor. The Trusted Advisors (as I’ll refer to the trio) suggests there are four components of trustworthiness. The formula boils down to credibility (the words you say), reliability (the actions you take), intimacy (the way you make people feel), and self-orientation (the motives you are driven by). I’ll unpack each element and what you can do to align your content to build trust with your audience. 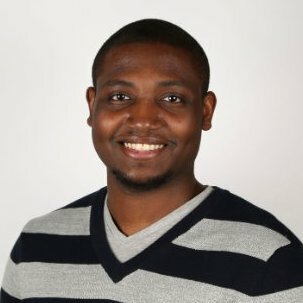 Credibility: Do I believe what you’re saying? The element of credibility relates to the words you say. In this case, the content you put out into the world. These are your blog posts, sales pages, emails, and infographics. We use our content to position ourselves as experts and make an appeal to rationality. That means raising the bar on the value you provide to your audience. Try scouring the web for topics nagging your audience that haven’t been thoroughly explored. Then create a piece of in-depth, long-form content. Long-form content often results in higher ranking in search results, increased time on site and more shares on social media. By establishing yourself as a credible source, you're more likely to be linked to online. Intimacy: Do I feel comfortable sharing this with you? In relation to content, it’s about deepening the connection with your audience. How does what you’re creating understand and work to solve the challenges they face? How relevant is what you produce to the information they’re seeking? To build a true sense of intimacy into your process, you have to lead with empathy and tell stories. First, apply the process of human-centered design to your process. Learn directly from the people you’re creating content for. Talk with them in person. Observe them in forums and comment threads of places they visit online. Listen to uncover their hopes and dreams and the obstacles slowing them down. Once you identify opportunities to provide the most value, create story-based content that your audience will appreciate. But why tell stories? Because stories help to create an emotional connection with your audience. Digital entrepreneur Jeff Bullas once said that “...stories gain trust. Whomever you decide to share your personal stories with, it makes you closer, right? The thing is that storytelling is quite an intimate thing. You don’t tell stories just to anyone." Reliability: Can I count on you? With regard to content, reliability boils down to what readers can expect from you. Consider your editorial calendar, content distribution plan, and your messaging strategy. Now consider the following questions. Do you deliver consistently? Does your audience know what to expect? Are your quality standards unwavering? Author and marketing maven Seth Godin publishes a post every day on his website. He's been doing it since about 2008. He regularly delivers thought-provoking, intriguing ideas --and the quality doesn’t suffer. By showing up on a regular basis, your audience can begin to rely on your council and your content. Moreover, regularly updating your website increases your chances of ranking higher in search engines. After all, your reputation is a made up of the repeated experience someone has with you or hears about you. Self-Orientation: What are your motives? For marketers, it’s important that your focus is on serving the clients needs first and always. By creating content that informs, educates and entertains, you can attract qualified leads. In fact, consumers are 131% more likely to buy from a brand immediately after they consume early-stage, educational content. Building trust with your audience is a key long-term goal for brands and businesses. If you can routinely put out credible content valuable to your audience, you can work to earn their trust over time -- and ultimately grow your business. For more ideas on elevating your content marketing, subscribe to the LinkedIn Marketing Solutions blog.